I was bitten by the travel bug early and my first travel companions (like many of you) were my parents. When I used to travel domestically with my parents as a child, my dad always had this inner pocket somewhere in his shirt or trousers to keep money and often I used to find this very funny. I used to think that who would steal or why would people steal? Everyone’s busy in their own life or they seem to be in rush isn’t it? But then when you read headlines of pickpocketing in paper you know that keeping safe is better than being sorry specially when traveling. Traveling the world has made me aware of certain places in the world that are far from safe. For example, in metro trains in Paris, there are big warning signs on pickpocketing. An Indian tourist that I had met in Turkey told me that his wallet was pick-pocketed in Athens Greece and the Police were not cooperative as they said for them it happens everyday. In touristic spots of Italy too one has to be very aware of keeping their money safe. Although, it’s been a journey of its own kind for me, I would tell you how did I keep money safe. 1. Carry front or side facing backpacks in crowded areas: Most of us carry our backpack on our back, but it’s foolish to stuff in wallet and passport on your back because in crowded areas they simply can take it out from the back and you wouldn’t know. I remember I was staying in a hostel in Athens, and there was this girl who had the same incident where her wallet and passport was taken out in the metro train. What surprised me was she had her brother in the same compartment just a distance away but these pickpockets work in groups and they surrounded her in the crowd and someone took wallet and passport. And she had to request her mom to transfer money in her account and had to request the embassy for a new passport which was going to another 15 days so she had to stay 15 days longer. In cases like these, it’s important to keep money and passport separate in a side facing or front facing sling bag with zip (no open bags with magnets) separate from the backpack. Even if you lock the backpack, it can be broken. Also be aware when getting in or out of the metro as that’s the time when the crowd comes in or out. 2. Take out currency in separate ways: Now what I do is, usually I take part money as a currency and part money in a travel card. For example, if I am traveling to US, I would convert the Indian currency to US currency i.e Dollars and If I am traveling to regions in Europe, I would convert the Indian currency to Euro. I would use travelers card to use it for my daily travel and when and wherever travelers card are not accepted I would use the currency which is also very important to keep because not everywhere you can use Travelers Card. A lot of people do take out local currency using their debit card in international locations, but that also incurs conversion rates and you also have to search for an ATM. I have used it once in Malaysia. When coming back to India from my travel, I would convert the currency back from euro to inr. 3. Don’t carry loose money anywhere in display: There are certain pockets everywhere in the world which is not safe. For example, when taking a walk in Chicago between Greyhound Station and China Town, that stretch is very very unsafe with homeless and messy people on road. In that case, do not even attempt to flaunt money even to your friend because that might be very risky. I generally do not encourage giving money to beggars surrounded by similar looking folks, because they may forcefully demand more. It’s better to say no. Unless if they are performing and are at a good location. Also, in trains, it’s better to sleep with the money in your inside pocket than to lose it from your money casually kept in bag kept below. Also lock your belongings in train at all times to prevent random stealing. 4. Don’t carry money in Check-in bags: Carryon bags or an extra sling back is a good way to carry money in airports but don't put all your money in Check-in bags. I used to keep separate currencies in different bags splitting up which I still do with carry on or after reaching a place, but never with Check-in bags. Because recently when I flew inwards to US, they had my locks broken and also the coins that I had in my box was spread out in my check-in bag. Although nothing was lost but I would still not recommend it. Once you land in a place, you can put some amount of money in your check in and lock it. 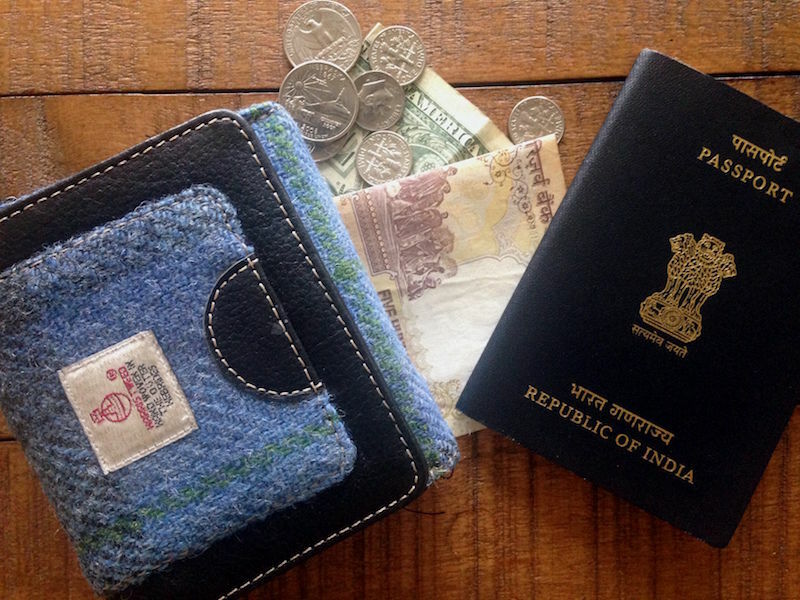 Once you reach the hotel, keep money safe in safety locker with your created passport and take out money for each day and keep in your wallet and keep it in your front pocket. 5. In case if you lose your credit card or debit card, immediately block: Credit Card or Debit cards can lead to massive transactions in a jiffy. Most of the places don’t even tally signatures. I have had my Debit card lost once and there was an immediate transaction of around 12k, by the time I had blocked it. I would suggest keeping lost card numbers handy of your bank and as soon as it gets lost, block. I would recommend carrying two cards, in case if you lost one and need another. Also take photos of your credit card and keep it with your family or with yourself in locker. Keep passport copy photo with you at all times. 6. Be aware of most used currencies: Currency Conversion Rates can go up and down and its best to use widely used currency applicable for the region. For example, if American Dollars work in Canada, use American Dollars before changing currency to Canadian Dollars. If Euros work in Switzerland, use Euros instead of Swiss Francs because these are widely used currencies and would leave you with less currency loss. You will also be able to use them in multiple locations without converting or losing currency. That’s why a lot of people do save dollars after they come back from a US trip because it can be used in other countries too. Remember in case you want to, you can always convert us dollar to inr at any time. 7. Don’t login into Internet bank websites from Cybercafes: Cyberbullies and Cyberhacking is something we hear on Internet but most of us have never faced it and so we assume it’s safe to login with your bank credentials from Cybercafes which sometimes could be not. Sometimes the cybercafes can save your passwords or can monitor your activities and hence it’s not advised. 8. Walking with your shiny purse in the middle of night, not done: Purses are favorites with pickpockets. They know women carry money and if you walking in a lonely street in the middle of night anywhere in the world, there could be people who can attack you, try to steal or even pickpocket. Do not carry purses when walking on lonely street. Avoid lonely streets. Keep it casual. If you are wearing jeans, keep a little money in your front pocket. Take a cab etc. 9. Do not disclose Financial Identity: A casual chit chat with your cab driver and a few questions blurted here there may make you flaunt a little on how well to do you are. Do not get over friendly with cab drivers and reveal Financial Identity on how much money do you have and I travel business class etc. These incidents rarely happen but might. 10. Keep Change: And last but not the least, if you are traveling within a country in local transportation, it may require you to have some change as in many countries including USA they demand exact change in bus or other local transportation. Some countries also have automated kiosks like in Italy where you have to insert in exact coins at metro stations or use a credit card. It also helps with food kiosks where exact change is required to get that bottle of coke or chips. In some places, washrooms are paid, I think it was Zurich airport where there is one paid washroom. It also helps when buying in local stores. Thanks everyone. I hope this was helpful. And if there is any other Financial tip that I missed, feel free to comment below. Although, I have generally found it cheaper to use a credit/debit with 0 overseas fees rather than loading a prepaid card. TC's and exchanging cash from money exchanges have always seem to cost me more than using an atm even with a small conversion fee.